Dunkin' Donuts Switching to Just "Dunkin'"
Dunkin' Donuts will officially change its name to "Dunkin'" in January of 2019. It's a move that de-emphasizes the chain's donuts while better reflecting the amount of coffee the chain moves. 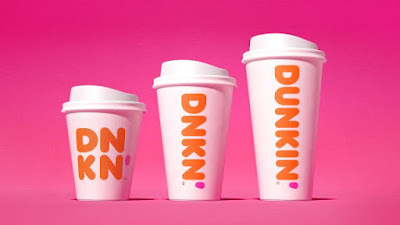 Dunkin' accounts for almost 22% of U.S. coffee cafe sales according to Statista.com (compared to close to 40% for Starbucks) and, for years, has touted the tagline "America runs on Dunkin'" rather than "on Dunkin' Donuts.". By the first of the year, Dunkin' will be featured on the brand's packaging, advertising, website, and social media. The "Donuts"-less logo will also find itself on all signage at new and remodeled stores in the US and, in time, internationally as well. That's not to say that they're putting donuts on the back burner. The chain is still the number one retailer of donuts in the US and, apparently, 70.29 million Americans have eaten Dunkin's donuts this year.